Conical Probes by United Sensor Corp.
Conical Probes are generally used for static pressure, total pressure and direction measurement in supersonic streams. The straight heads are usually mounted in a special holder. As pitch and yaw measuring probes, they can be mounted in a holder with angular adjustment in two directions and the angles determined by balancing the pressures measured at opposite sets of holes. The angles can also be determined up to about 16° with the probe in a fixed position by reading the pressures and calculating pitch and yaw angle from the readings. Where the air stream has a pitch or yaw angle of less than 10°, the average pressure of the four holes corresponds closely to static pressure of the same cone at zero angle of attack. 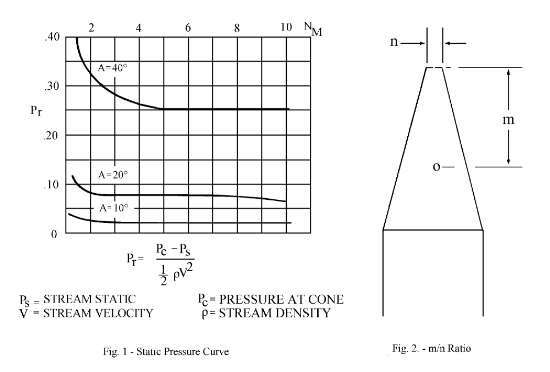 The static pressure measured on the surface of the cone can be corrected to true stream static theoretically, following curves of the general shape shown in Fig. 1. Total pressure of Types B and D can also be corrected theoretically to give free stream values so the probe is useful as a supersonic velocity probe. The total pressure holes in Type B and D give a blunt tip to the cone, which will affect the static readings if the ratio m/n (Fig. 2) is less than 25. This limits the minimum size of probe of this type which can be used with purely theoretical corrections since the minimum size of blunt tip is approximately .025". However, a smaller m/n ratio can be used if the probe is calibrated against some other standard. Types A and C probes are more convenient for static pressure measurements in the smallest sizes. National Advisory Committee for Aeronautics, Technical Note 2190, describes tests made on conical tip probes and gives references for the calculations necessary to correct the readings to stream static and total. Other NACA reports TN 1428, 2579 and 3213 give further information on the use of conical probes.